As you may know, I’m a huge Star Wars fan. What I love about the series is that there’s always something new you can learn about them. Today I’ve gathered some fun and interesting quotes by my favorite actors and actresses (Carrie Fisher, you rock!) that participated in the great franchise. Enjoy! The Times reports I’ve made £4.5 million in the past year. Where do they get such nonsense? Science fiction – which gives me pause – but it is to be directed by George Lucas, who did American Graffiti, which makes me think I should. Big part. Fairytale rubbish, but could be interesting. It’s a pretty staggering film as spectacle and technically brilliant. Exciting, very noisy and warmhearted. The battle scenes at the end go on for five minutes too long, I feel, and some of the dialogue is excruciating and much of it is lost in noise, but it remains a vivid experience. It’s a little-known fact, but I wanted Han Solo to die at the end of Star Wars: Episode VI – Return of the Jedi (1983). I thought it would give more weight and resonance. But George Lucas wasn’t sympathetic. He didn’t want me killed by those teddy bear guys. I think The Force is in you. Force yourself. He’s not a cardboard character to me at all. He’s as real as anything else. I never thought of the character as having only two dimensions until the critics said so. And they’re wrong. The third dimension is me. Mark [Hamill] was off on Dagobah while Harrison [Ford] and I were were getting drunk in Cloud City. I’m now a Disney Princess! The idea of The Force is basically “Religion’s Greatest Hits”. I can’t tell you how much we laughed on the set to have Alec Guinness in a scene with a big, furry dog that’s flying a space ship. I laughed all through Star Wars — I thought they were comedies. It was absurd having a big giant dog flying your spaceship and this kid from the farm is wacko for this princess he’s never met, that he’s seen in a hologram, the robots are arguing over whose fault it is … You know, they hook up with a magic wizard and they borrow a ship from a pirate … It was goofier than hell! I loved it! I just seemed so fresh, and like Wizard of Oz meets technology, or whatever, and this and that all thrown together. Actually, I really want to play Princess Leia. Stick some big pastries on my head. Now, that would be interesting. I’ve been waiting nearly twenty years to have my own lightsaber. Nothing’s cooler than being a Jedi Knight. I’m not supposed to say anything but, let’s face it, Jedi knights never die. I always wanted to be a cowboy, and Jedi Knights are basically cowboys in space, right? Hahaha Ewan. I love this guy. Me too! I’m excited and a little scared at the same time. 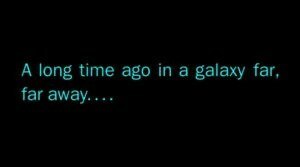 I just hope they do the first three movies justice and expand the Star Wars universe in a good way. I liked them, but there were some things missing. And some of the acting was off. Maybe with a new cast, new director and a new story they can achieve the greatnest of the first three. Love him. He’s such a funny guy. And his work is amazing. Yoda is the ultimate master!